Clayton's Custom Fishing Rods was founded in 2015, following 11 years of employment at Harrison. 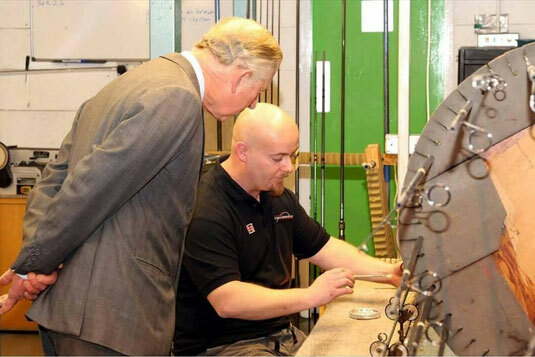 During those 11 years I've built every type of rod imaginable, from coarse rods to top end salmon rods, the highlight of which was being involved in building a rod for Prince Charles when he visited the factory. Through this, I've gained a huge amount of experience in building rods to a very high standard, day in and day out. My work didn't stop when I clocked out either, often undertaking private rebuilds and repairs in my spare time and gaining an exemplary reputation as a result. As an experienced angler myself, I'm always happy to help with any fishing related questions or advice too - I started fishing canals with my dad at a very young age then moved on to a bit of match fishing. The big fish bug then took over and as a result, I've been a carp and specimen angler for last 20+ years. CCFR hold accounts with Harrison, Free Spirit and Century, allowing me to offer a wide range of top end blanks. As well as the Harrison range, I'm really looking forward to working in conjunction with Freespirit and Century, getting to know their products and putting my own custom touch to them. The long term goal of Clayton's Custom Fishing Rods is to offer a unique selection of rod building components at a very competitive price, with a fast turn around and great customer service. All feedback is very much appreciated, please feel free to use the "contact us" button above to help CCFR continue with our goal. and can cover every need.